We frequently see people digging on their allotments. Digging is synonymous with gardening, and double-digging is a standard gardening technique. It is the gardeners’ equivalent of ploughing, and the principle is the same: you get an explosion of nutrients as you add organic matter and the microbugs in the soil die, causing a boom in soil fertility. So why would you not dig? It is incredibly disruptive. The microbial life that you are killing when you turn it over like this, is vitally important to the health of the soil. There are billions of workers in the soil who’s natural life cycles provide nutrients as they die, as does their work when alive. 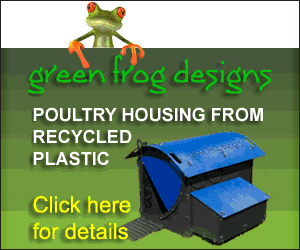 If you kill off the earth’s natural fertility it has to be replaced. In large-scale agriculture this is done with the use of chemical fertilisers. This is relatively common in the garden, too, but even natural inputs such as horse or poultry manure are an additional cost unless of course you already have access to a free supply. With no-dig gardening, worms, beneficial fungi and other soil life is encouraged, which feeds and aerates the soil. Not digging means that you can put the microbial life to work for you, save money and be more environmentally friendly. It is hard work! Double-digging is long, hard, back-breaking work, done at a time of the year when it is cold and wet. We haven’t dug our allotment beds since we made them five years ago and have no intention of doing so. Even relatively lower-work methods such as forking through (loosening the soil with a garden fork) still involve quite a lot of work. This doesn’t mean that no-dig means a work-free garden, just that the work is reduced and is focused on other areas, which has a knock-on effect in further reducing work elsewhere. Digging works weed seeds to the surface where they can germinate and thrive. No-dig reduces weeds by out-competing them. You will need to add organic matter in some way, be it via your own compost, or ‘chop and drop’ mulch – plant mineral accumulators such as comfrey in the garden – cut them down periodically throughout the growing season and drop the leaves on the beds. If space is limited, bought compost is fine. 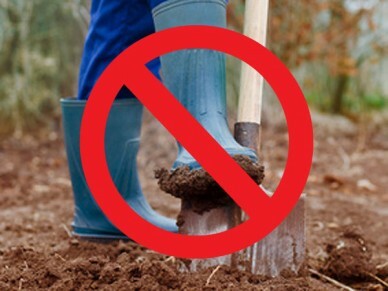 Done properly, no-dig is less work, reduces weed growth and productivity is as good as, or better than, digging methods. soil structure is improved, especially in heavy clay which will become more crumbly with improved drainage. there is a greater connection with natural systems – nature builds soil without digging, ploughing, tilling etc. It is important to feel connected with the soil and be improving rather than degrading it. No-dig is very simple. You just don’t dig! The simplest method is to apply a layer of compost/mulch material each year in the winter (you can lay down cardboard/newspaper first). Throughout the year you will need to build up your compost in order to provide this material for the following year, or buy compost if this is not possible. A cover of an inch or two is enough to suppress most weeds and build the soil structure. You will need to weed, especially to begin with but, as detailed above, this should diminish as your system grows. Do bear in mind that, if you are trying to eradicate perennial weeds such as bindweed, then you will need to lay down a thick layer of cardboard or newspaper for a year or so to deprive the weeds of light. Sustainability is a buzz-word these days and its impact can sometimes be lost. However, it is estimated that with our current agricultural practices, soil is being lost at between 10 and 40 times the rate at which it can be naturally replenished. This is clearly unsustainable but by practising no-dig gardening we can move beyond merely being sustainable into regenerative farming/gardening, where we actually build soil. If you are used to digging your garden you might not want to go all-out with no-dig, but why not experiment? Try growing the same crops next to each other – a dig vs no-dig showdown! Observe the results, make notes of what went well, what didn’t and plan for how to improve it next year.